If you were a DirecTV subscriber during the Masters no doubt you saw the awesome interactive coverage. Between all the live on course cameras, interactive scorecard and interviews…it was pretty awesome! Apparently it was successful enough for them to offer the same coverage during this week’s US Open at Torrey Pines. I believe network coverage begins at 11am, so those of us lucky enough to work from home…or ‘be sick’…should be able to catch a ton of the Woods/Phil/Scott pairing. For those of you stuck at work, check out this post, I’ll do my best to find a live stream of the US Open coverage online. We have been able to find these in the past, and I’m sure there will be plenty of them around again this year. As the US Open approaches this week, anticipation is brewing for one of the most talked about first round pairings of Tiger Woods and Phil Mickelson. Last week, I found myself telling a buddy â€œWhat I wouldnâ€™t give to follow that pairing for the whole day.â€ I was excited to learn that once again, DIRECTV is offering its customers services above and beyond those of any other provider with US Open Interactive, a free interactive service to significantly enhance the viewing experience for this weekâ€™s U.S. Open. 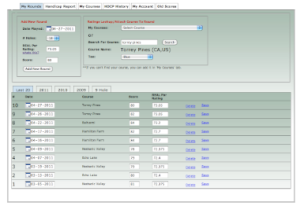 The service offers a â€œfeatured groupâ€ channel that allows viewers to follow the featured group for an entire round. With the PGA creating a â€œdreamâ€ pairing as Tiger and Phil will play together, DIRECTV customers will have the ultimate way to experience this rare and historic group. In addition to the featured group channel, the service also offers a â€œfeatured hole channelâ€ in which viewers can watch each and every group take on Torrey Pines hole 3. A third channel (Up Close) will offer live and taped interviews with players from the practice range and post-round press conferences, as well as other feature stories to related to the historic American major. 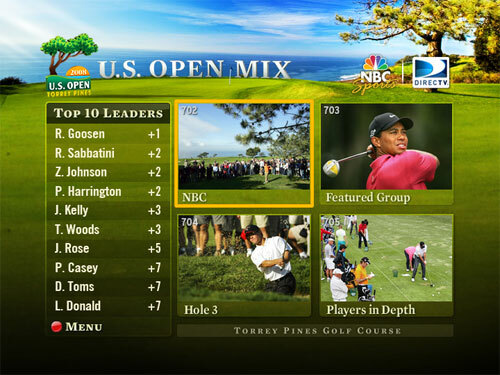 In addition, US Open Interactive will feature the NBC broadcast as well. DIRECTV will bring this all together via a US Open â€œMixâ€ Channel on which all four channels will be visible on the same screen. Viewers can then navigate between the four screens to hear audio from each, and tune to any of them directly with a push of a button on their interactive remote. The US Open Interactive service will be available on Thursday and Friday of this week. Now, if you’re looking for some details about the South Course at Torrey Pines, NBC of San Diego has put together a great coverage site. They have video previews of each of the 18 holes along with a ton of other great video content. For those of us who aren’t about to get out to beautiful San Diego, it doesn’t get much better!